I’ve always had a hard time starting plants from seed. The seeds come up, but seem to rot off at the soil line before they ever really get a chance to develop true leaves. I got this recipe for a seed starting mix from Kari Spencer of The Micro Farm Project at the Great American Seed Up last fall, and I’m trying it out this spring. So far, so good! Before you put the mix together, heat your compost in the oven at 180 degrees for 30 minutes to sterilize it. To start your seeds, moisten the starting mix in a bucket (if you use coconut coir, just getting it out of the compressed block it comes in will make it pretty damp!). Fill your seed trays to the top with your starting mix. Firm and level the soil. Add 2-3 seeds per cell. If you have very small seeds, plant them on top of the soil and then cover them with a sprinkle of vermiculite. 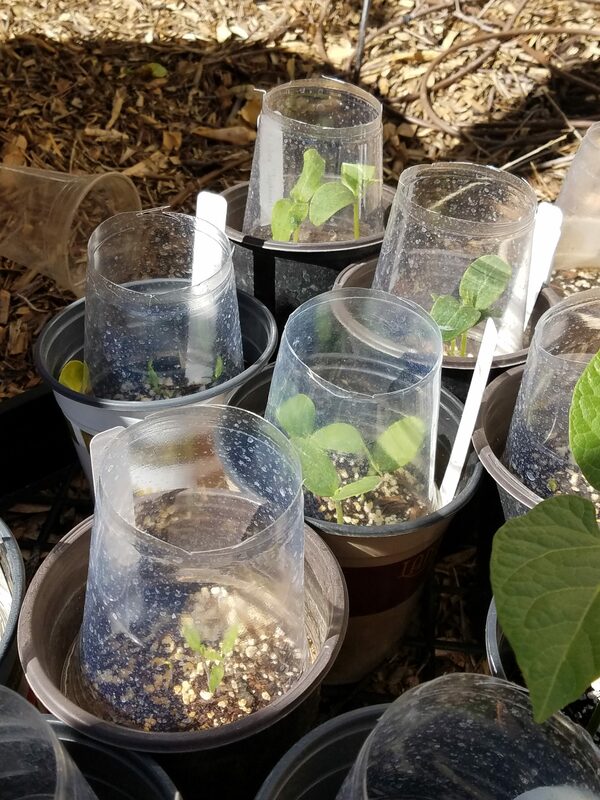 In my case, instead of starting seeds indoors, since it has been a warm spring, I opted for starting them in small 3-4″ plastic nursery pots I had laying around. To protect them, and also add a little more heat, I used a trick a friend taught me, topping each pot with a clear plastic party cup, that has the bottom cut off it. It seems to keep just enough heat and moisture, and protects the new little sprouts from the birds until the plant is a bit bigger and can fend for itself.